Ten minutes from the city of Carcassonne, close to the Canal du Midi, you will enjoy the tranquility and charm of this village house completely renovated and located in the historic center of a village with shops. A bohemian-chic style combines charm and comfort in this house ideal for 4 or 5 people. 2 bedrooms, kitchen, living room, bathroom with shower, garage, INTERNET and tv box. You will also enjoy the pleasant garden owners, nestled at the foot of the church where you have your own dining area ... whether in a deckchair, in the hammock by the pool, or busy in front of the barbecue! A totally relaxing week, thank you Lydie, Marc and family ... especially Margot! We enjoyed a comfortable and peaceful week at this well located, quirky and atmospheric house and garden. Beautiful house in a quiet location with plenty of amenities.The pool is a fine size and was enjoyed by all our family. Myself, husband and two small children had a really pleasant stay with Lydie and Marc making us feel very welcome and comfortable. I would recommend this gite to any body wishing to travel and explore the region or just for a getaway. Really lovely . 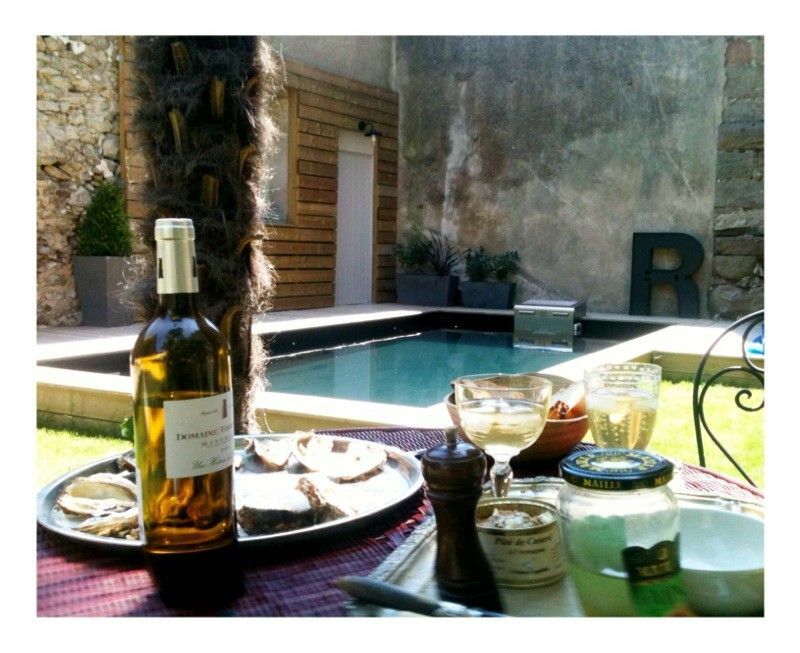 The house and garden are a perfect retreat after days spent in Carcassonne. “Little House Lydie and Marc, the hosts, call it affectionately. I stayed for two months in this spacious two-bedroom cottage in winter. It has modern amenities but still maintains the old-world French charm and ambiance. Even in winter, the house was easily heated and homely. At first, I went to the local market on Sundays to gather the wonderful local produce, returned to the kitchen and experimented with many recipes. Then I began venturing out to the Saturday market in Carcassonne (easily accessible by the number 10 bus which runs every hour except on Sunday/public holidays). Here I have discovered many secrets of ‘Sud de France’; charming restaurants along the canal, great local wines, and enjoyed cooking, painting local landscapes, hiking, etc. The hosts speak fluent English, are helpful and make you feel welcome. Recommended for short or long stay. Das kleine Haus mitten in Trèbes hat einen zauberhaften Garten direkt an der Kirchenmauer mit einem kleinen Pool, Adirondeckchairs und Tisch zum Draußenessen. Wir haben dank guter Matratzen sehr gut geschlafen und uns von Anfang an wohl gefühlt, denn der Stil der Einrichtung gefällt uns bestens. Wegen der steilen Treppe sollten keine Gäste mit Gehbehinderung oder sehr kleine Kinder hierher kommen. Im Ort gibt es Bäckereien, Möglichkeiten zum Einkaufen, Post, Restaurants, Tabac/Press, Fahrradverleih usw. Das beste Restaurant in Trèbes ist Le Moulin (hervorragend), aber die Trattoria ist in ihrer Preisklasse prima, also beides mal ausprobieren. Wir empfehlen Lagrasse und Termes (Gorges) zu besuchen und dort im Fluss und den Badegumpen zu schwimmen. Gruissan Plage ist ein tolles Surfer-Paradies. In Collioure sollte man Anchois bei Roque einkaufen. Außerdem vermissen wir das kleine Kätzchen, das uns immer im Haus besucht hat. Lydie und Marc sind sehr nett und haben uns mit ihren Empfehlungen geholfen, damit wir diese Region lieben lernten und wiederkommen werden. Diese Unterkunft ist sehr zu empfehlen! De eigenaar van de woning is vriendelijk en behulpzaam met het geven van tips voor de omgeving. De woning is van veel gemakken voorzien wat apparatuur betreft. Er is ook speelgoed voor kinderen aanwezig. De tuin en het zwembad waren niet groot maar wel goed. Het betreft een bovenwoning en de trappen waren een minpuntje voor ons. De ligging in het centrum van het dorp, vlak bij de haven en diverse horecagelegenheden was fijn. Ces tarifs s'entendent pour les deux chambres et un maximum de 4 personnes. Tarif dégressif dans le cas d'une location avec une seule chambre (nous consulter). 25 € par nuit par personne supplémentaire Basse et moyenne saison, location possible au mois, nous consulter pour les tarifs.